On a Friday afternoon recently I was on my way to a 5 p.m. appointment with a customer when I encountered a traffic hold-up in a mid-Wales town. I soon realised there was no chance of making the appointment so I phoned up to re-arrange it. It took 55 minutes altogether to get through the bottleneck (a set of three-way traffic lights at some roadworks already abandoned for the weekend!) so I had plenty of opportunity to reassess the rest of my day. Would the evening be an opportunity for some landscape photography as I had originally planned? And, if so, where …….. ? Another interesting possibility suddenly entered my consciousness. Some ten years ago I had been told that hawfinches could be seen at a particular churchyard during June. It wasn’t that far away! It might be worth a shot. Half an hour later I was there. At first the churchyard was ominously quiet. Then a stocky bird flew behind a yew tree and disappeared. Hmmmm…..what was that? Before long a series of these apparently random bird movements began to build into a picture. And then a hawfinch perched for a few seconds on top of one of the yews. The churchyard was heaving with them! Well, I’m exaggerating, but these birds are so rarely seen, let alone photographed, and I felt that with patience I might have a chance to do the latter. Long after the sun had vanished behind cloud a hawfinch perched right out in the open on a gravestone. The next morning one was present when I arrived about 7.30 a.m.; it flew immediately, landing briefly in a cherry tree (where I photographed it) before joining a group of others a few hundred yards away. It was to be my last opportunity for several hours. I searched for a position where I could observe as many of the yew trees as possible, eventually settling (literally) on a tomb by the main door of the church. Single hawfinches came and went, disappearing low into the yews, or dropping in from the top. A bird would fly behind a yew and not reappear from the other side. Birds flew behind the church. They flew into a sparsely-leaved holly tree and disappeared. It was as if they were wearing an invisibility cloak. On the odd occasion when a bird did perch out in the open it was silhouetted against an excessively bright sky. The sun was still behind the dark foliage of the yew trees so metering was difficult and a correct exposure virtually impossible. I tried to estimate an optimum exposure and use manual metering but that didn’t help. It wasn’t going too well. More of the same followed during the afternoon. At one point a party of four (presumably a family) appeared from nowhere, flew a few yards above my head and went who knows where. I did manage to identify their redwing- or robin- like song/call but these were so high-pitched as to be almost “not there”. Enigmatic really is the best adjective to describe the hawfinch. To pass the time between their visits I photographed other species – house sparrow and jackdaw – images which, apart from their lack of rarity value, I prefer to those of the hawfinches that I did eventually manage. Meanwhile passers by came and went. I felt rather self-conscious with my paparazzi-style lens. One young woman asked me what I was doing and I told her I was trying to photograph some unusual birds. What birds were they? “Hawfinches” I said. “Are they like magpies?” she asked….. Later she walked through without speaking and I got the feeling she had decided that the strange man lurking around the churchyard was up to no good. If you had a suspicious mind, read the wrong sort of newspaper, and knew nothing about birds, it would be easy to believe I was taking the ****. Hawfinches indeed……..
As the hours passed the sun gradually swung around to the west and sank lower in the sky. The light was getting better! There was a flurry of hawfinch activity during the evening and I managed the most successful images of the day. Phew! It had been worth the wait! 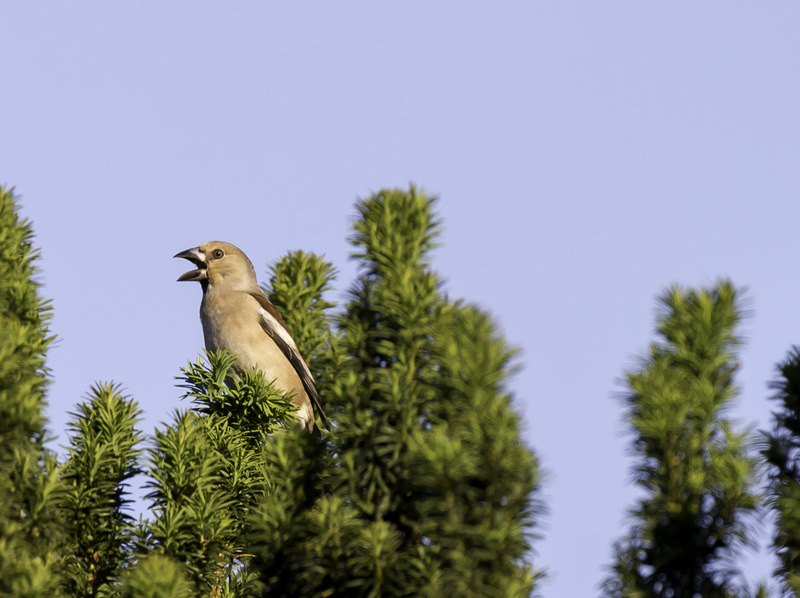 This entry was posted in Uncategorized and tagged hawfinch, photograph, photographing, wales. Bookmark the permalink. A very readable and interesting account of your day Jeremy. Thanks! I always try to include some non-photographic interest if possible.